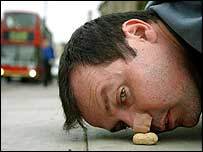 A performance artist who used his nose to roll a monkey nut for seven miles has announced his next stunt - turning himself into a full English breakfast. Mark McGowan, from Peckham, south east London, has said he will sit in a bath of baked beans, with two chips up his nose and sausages wrapped around his head for 12 days to celebrate English culture and food. The 37-year-old is due to step into the bath, which will be in the shop window of the House Gallery in Camberwell, south London, on 14 November. In September the fine art graduate rolled a monkey nut from Goldsmiths College in New Cross, south London, to the door of Number 10 Downing Street to protest against student debt. Mr McGowan said his latest project was came about after a friend, who was visiting from Italy, criticised the English diet. "I took him to a traditional English pub but he started to complain when he saw the menu," he explained. "There were things like eggs, chips and beans or steak and mushroom pie with chips and beans, but he didn't seem impressed by the cuisine. I suppose he would have preferred mozzarella. "It got me thinking about how much some people criticise our food - even blaming a good old fry-up for obesity. "We don't support our culture enough, so I thought I would celebrate a part of it by turning myself into a full English breakfast." Mr McGowan added: "I suppose I am the British alternative to David Blaine but sitting in a plastic box is nothing compared to what I will be doing."